ISO 27001 is the international standard that describes best practice for an information security management system (ISMS) and is the only internationally-accepted, universal standard for information security governance. In a nutshell, the ISO 27001 standard tells you how to implement, manage and maintain an effective information security program within your organization. Achieving certification is a great way of demonstrating your commitment to information security to your clients and stakeholders. Our experienced ISO 27001 consultants focus on creating an Information Security Management System (ISMS) that is tailored, realistic and sustainable. The ISO 27001 certification process embeds industry specific controls by considering standards and regulatory requirements relevant to your organization. 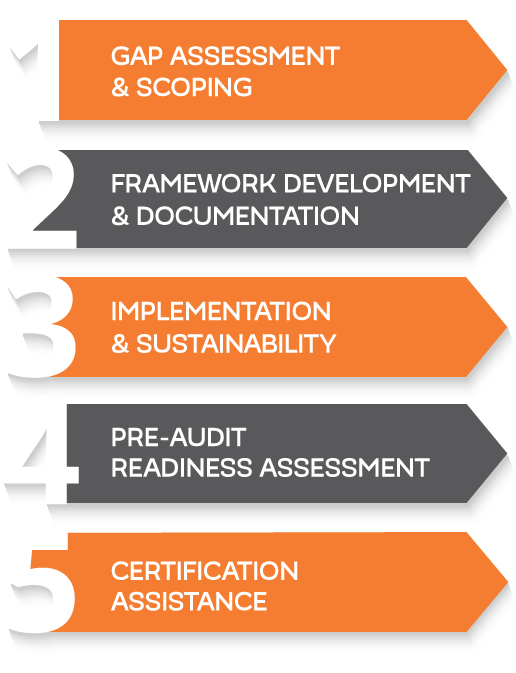 Our consultants can either provide guidance and support across the full implementation lifecycle or focus on specific areas such as performing a gap assessment or creating information security documentation. We work with our clients to develop the right solution for their organization in the most cost-effective and efficient manner. FOR ASSISTANCE WITH ISO 27001 CERTIFICATION, PLEASE COMPLETE THE CONTACT FORM BELOW OR SEND US AN EMAIL AND ONE OF OUR SUBJECT MATTER EXPERTS WILL RESPOND TO YOU SHORTLY.